In collaboration with colleagues at Teachers College, Lamont scientists developed the Where Are We? 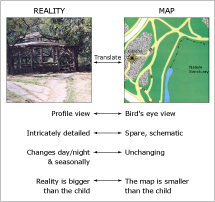 software and associated curriculum materials to help elementary school children learn to "translate" between the visually-perceived world that they sense around them, and the schematic representation of that terrain on a map. This skill, which is essential to a career in field sciences or to effective functioning in today's mobile society, is rarely taught in schools. Where Are We? sets up situations in which students must repeatedly determine correspondences between a map location and the videoed view from that location, as they seek to move to a chosen destination, add new information to the map, or figure out where they are when dropped at an unknown location. To inform the further development of Where Are We? and to contribute to basic knowledge of human’s use of spatial representations, Lamont and Penn State scientists are documenting and analyzing the nature of misconceptions in map use. We have developed field-based map skills assessments in which participants place colored stickers on a map to indicate where they think a similarly-colored flag is located in the represented space, and place colored markers on the ground to indicate their notion of the location represented by a similarly-colored sticker on the map.